I may be the only person you know who has read all three of Danzy Senna’s novels. There’s a memoir and a collection of short stories that I’ve not read so I can’t call myself a super-fan, but I’m a fan-boy. I might even have to confess having something of a crush, an author-crush, on her. New People, like her previous two novels, deals with people at the intersection of black and white in an age when what it means to be each seems to be a bit in flux. Ms. Senna’s characters, women mostly, are of mixed heritage. Looking at them, many people who prefer folks to fit neatly into one category or the other will be made uncomfortable. New People, again like her previous two novels, deals with obsession, in particular with obsession over the wrong person. In this case a young woman about to be married to the “perfect” man is obsessed over a poet she met only in passing once. As her wedding day draws closer, she finds her path crossing with the poet’s in unexpected ways. Should she act on this opportunity? Should she stay with the perfect man, Khalil? What could become a basic, if very well-told, romantic triangle/thriller, is kept from this by two things. First, Ms. Senna’s themes are really about the nature of obsession, not the nature of love. What are the things that haunt us throughout life? Why do we remember people we knew only briefly, or even not at all, for years and years even when we are happy with the people in our lives? How far are we willing to go to get closer to those over whom we obsess? While New People is about obsession, about love, about moving from college age romance to more settled middle-age, themes common in all three of Ms. Senna’s novels, the story is set in the world of racial and bi-racial America which comes to dominate much of the novel. I’m not really sure how to describe this. The setting is within the Black community in general, but in specific among bi-racial Black America, which does include a healthy selection of white America. New People. …Stanford University, circa 1989. The era of the T-shirt revolutionary,. The ear of the anthology. The era of the individually designed major. The same year the school officially changed the term freshman to frosh so as not to alienate “half the sky.” 1989. Both the beginning and the end, in other words, of everything. Here the cast of young people both black and white discover just how much their race matters. It’s the point when some of the biracial characters realize they are black. They dive into their new-found blackness head first, change their speech, adopt new forms of dress, become activist members of the BSU. I remember what it was like to discover I was gay in college. I know it’s not the same thing, I’m not saying it is at all, but it’s similar enough to see how what Ms. Senna describes rings true. And it really was very 1989. There was a major earthquake that year, as I recall. I’ve only one slight issue with New People, the way the Jonestown Massacre is used as a literary device. Ms. Senna’s heroine is working on a dissertation about Jonestown, namely the music the People’s Temple produced during its lifetime. I can see how this topic would appeal to the heroine, and Jonestown certainly was a topic on everyone’s mind through the 1980’s, everyone in the Bay Area anyway. Very few people who lived in San Francisco during that time were more than three degrees removed from Jonestown. I had a co-worker at my first job in education whose sister died there. For a time, I lived three blocks away from the former People’s Temple. The night it burned down I walked over to join the crowd watching the fire. The People’s Temple does related to Ms. Senna’s themes, clearly. Jim Jones brought together a large mixed group of people as many black as white from across America. It’ not outrageous to reference it in a book like New People. My unease with its use comes from how it serves as an object lesson instead of being integral to the novel. It’s not a novel about Jonestown. The Peoples Temple is only mentioned when events slow down enough for the heroine to return to work on her dissertation. The dissertation could be about any number of things other than Jonestown without affecting the overall novel. Whenever it came up, I would think of my co-worker, who was an African-American woman who might be a fan of Danzy Senna. How strange to find what happened to her sister used as a literary device. Still, I am recommending New People. I enjoyed it from cover to cover even when it was making me feel uneasy. But if you have not read anything by Danzy Senna, and there’s a good chance you have not, I recommend starting with Caucasia. I think that’s her best work so far. Until, maybe the next book…. I read “From Caucasia with Love” as it was called over here when it came out and it’s survived multiple book culls so I was incredibly excited when this one popped up. 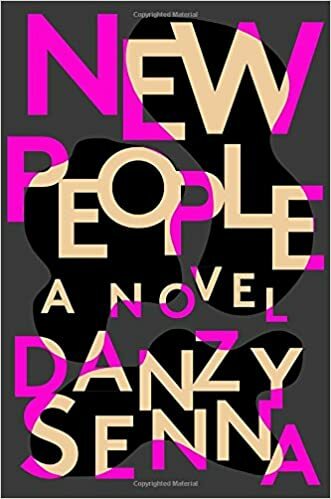 I didn’t review it very well though, I think (review here if you don’t mind me linking it https://librofulltime.wordpress.com/2017/11/02/book-review-danzy-senna-new-people/ ) and felt I was out of my depth in understanding it and thus picking up the satire. I agree with what you say about the use of the Massacre, it’s a bit soon maybe to use it as quite a lightly held device that doesn’t really add to the narrative. Link away. I’m always happy to send traffic to my fellow bloggers if I can.